As they were walking home from a Christmas Day brunch, Selaine and Harold were confronted by an all too frequent sight in Panajachel. A very large gang of male dogs was sexually abusing a lonely little female dog in heat. The famale was Mazie, one of the many street dogs cared for by Ayuda volunteers. Mazie had been scheduled for sterilization many weeks ago when she suddenly disappeared. But now here she was, on Christmas morning, beat up, and looking into the faces of the familiar humans as if in a plea for help. By coaxing with food, Mazie and the pack slowly followed Selaine and Harold to the front gate of their neighborhood. Eventually they were able to sneak Mazie through the gate and then get it shut just in time to lock out her 15 or more male suitors. Mazie was treated to a special Christmas dinner that night. But as the holiday passed, so did Mazie’s fertility. 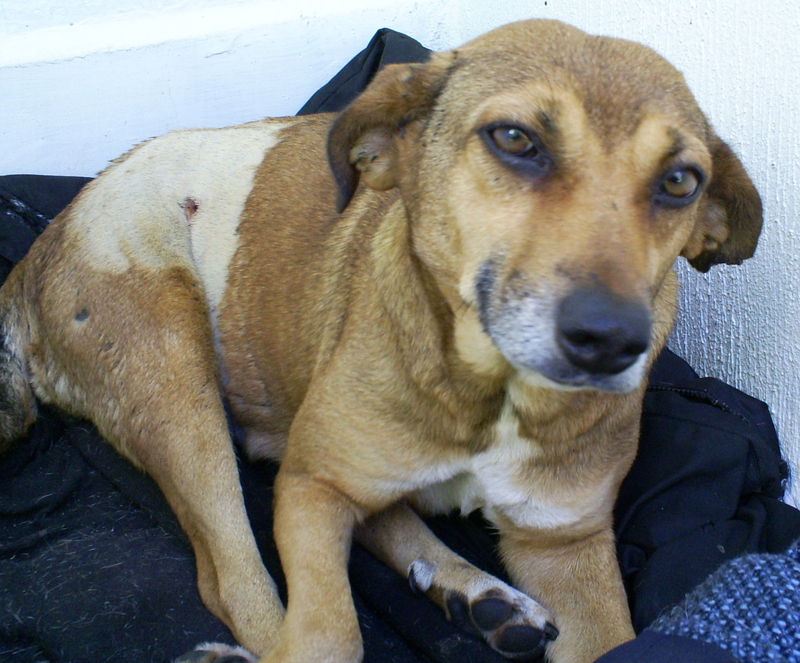 However, in performing the sterilization procedure, Dr. Miguel discovered that Mazie had an old hernia. She also had an extraordinary amount of mammary tissue from having so many litters for her young age. These factors complicated the normal spay work by causing the surgical entries to come in from her side. After a succesful procedure and beginning of her vaccination series, Mazie’s extended recovery has been fostered with the Ayuda volunteers. She is now doing very well and will probably be released back to her neighborhood within the next few days….unless someone with a kind heart would like to give Mazie a home. This little girl is very affectionate, polite, and completely unassuming. It is very clear that Mazie would make a content and loving companion for some lucky human.